Do you ever wonder if and when it’s time to raise your prices? Many people make price increases around the first of the year. How about you? Is it standard practice for you or has it been years since you did a price increase? 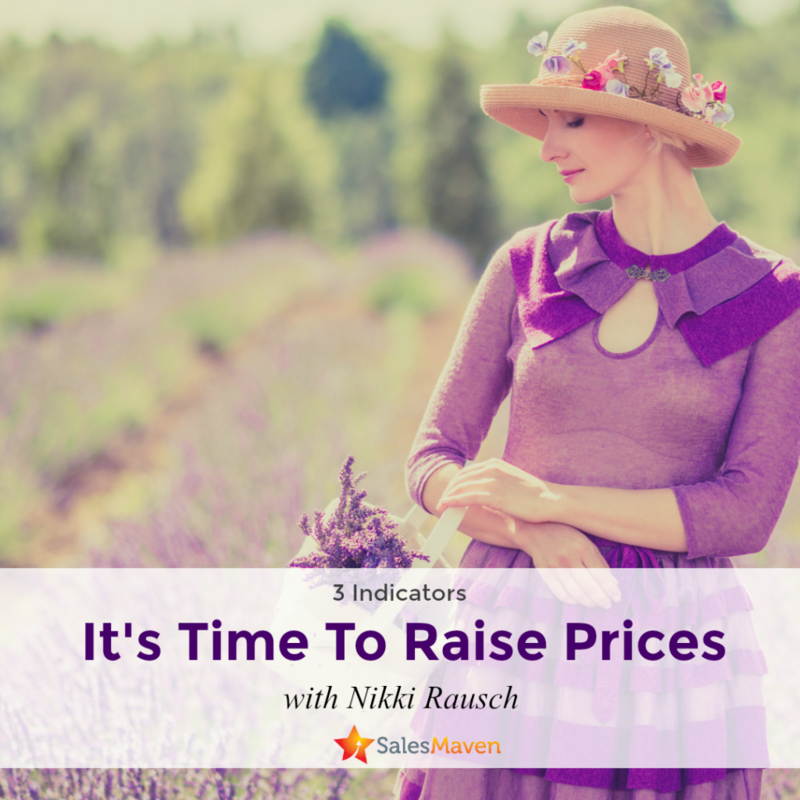 When to raise prices is a topic many of my clients struggle with. There are 3 key indicators it’s time to make an adjustment to your pricing. One of the first indicators it’s time to raise your pricing is when you’re not covering your costs. That seems so basic, I know. However, many people don’t factor in all the costs associated with delivering their products/services. When’s the last time you took a hard look at this? During a VIP intensive day this year I created a list of all the continuing education my client had spent money on in the last 3 years. The education she received is what qualified her to offer her services. Not just anyone could do what she does without having invested the same amount in their education. However, she wasn’t factoring her education costs into the price she was charging. Once she saw her costs down on paper, it was an easier decision to raise her prices. Of course, like all of us, she worried that raising her prices would cost her clients. Turns out it didn’t. All of her new clients didn’t even blink at her prices, it’s just what she charged, and therefore, it’s what they were willing to pay. When you’re clients are saying to you, “You don’t charge enough.” it’s time to make a price increase. Your clients shouldn’t have to tell you this, yet many of us have found ourselves in this same situation. At the Biz Chix Live event in 2017, this question was posed, “How many of you have been told by your clients you should charge more.” There was a staggering amount of hands raised in the room. In the last year, two of my private clients have shared they have customers that pay them extra for their services. Their customers don’t think they’re charging enough. This blows my mind. Would your clients say the same about you? Keep in mind, raising your prices isn’t about being greedy or taking advantage of people. It’s been my experience, the more I charge for my private coaching the better the results my clients get in their own businesses. The reason for the better results is they take my work and suggestions more seriously. They’re much more likely to implement what they’re learning when they’ve invested a substantial amount of money in their own learning. On the flip side, I’ve also lost out on working with people because they didn’t think my program was as robust as it actually is because the pricing was lower than what they’ve paid other coaches. Disappointing, right. How about you, are you missing out on working with ideal clients because your prices seem too low? When you think about what you’re charging now, do you feel at all resentful? Do you feel underpaid? Again, this is something many people have shared with me when we talk about what they’re charging. They resent doing certain work with customers because they’re not making enough. The hard truth is, they only have themselves to blame. When you set up your own pricing and offerings, it’s your responsibility to make sure it’s worth your time. And if you still want to offer the service, is there another possible way to deliver it? For instance, could you create a self-study course that you pre-record? That way you can still offer it to clients and it opens up time in your schedule to do other things? Based on the 3 indicators above, do you fall into one or more of these categories? If so, it’s time to reevaluate your prices. For those who want to raise their prices and need some assistance in how to talk about the price increase with clients, consider scheduling a strategy session. We’ll spend your strategy session crafting language to notify your existing client base of the changes.